An effective way to improve climate science and challenge the “climate establishment”? Environmental Protection Agency administrator Scott Pruitt wants to set up a Red Team vs. Blue Team approach to evaluating climate change science and policy, E&E News reports. “Defined loosely, red teaming is the practice of viewing a problem from an adversary or competitor’s perspective,” notes Red Team Journal. In this context, the idea is to assemble a group of climate science and policy experts who would dispassionately seek to challenge the assumptions, data, and policy proposals that constitute the climate consensus. In a sense, science is supposed to be Red Team vs. Blue Team all the way down. Researchers test each other’s hypotheses and findings, trying to poke holes in what has been reported. If a hypothesis survives numerous attempts to falsify it, it is generally accepted as provisionally true. Clearly, Pruitt and some researchers who are skeptical of the more catastrophic predictions believe that the normal processes for evaluating evidentiary and policy claims have broken down with respect to climate science. One of those researchers is John Christy, a climatologist at the University of Alabama in Huntsville. In his March 2017 testimony before the U.S. House Committee on Science, Space, and Technology, Christy claimed that a “climate establishment” consisting of a small coterie of like-minded researchers has forged a “consensus of those selected to agree with a particular consensus.” These gatekeepers, he argued, exclude the views and findings of more skeptical climate scientists from consideration in various scientific reports, most especially the Intergovernmental Panel on Climate Change’s periodic global climate assessment reports. Steven Koonin, a physicist who served as undersecretary of energy for science under Obama, endorsed the idea in an April 20 Wall Street Journal op-ed. Red Teaming, Koonin argued, would “put the ‘consensus’ to a test, and improve public understanding, through an open, adversarial process.” This, he hoped, would lead to “transparent apolitical science” and better-informed policy discussions. As examples of successful Red Teaming, Koonin pointed to the Rogers Commission for the Challenger disaster in 1986, the Energy Department’s review of cold fusion in 1989, and the Clinton-era National Bioethics Advisory Commission (NBAC). The Rogers Commission did identify the malfunction of the O-ring as the proximate cause for the Challenger space shuttle explosion, though some critics argue its final report failed to hold high NASA officials accountable for the accident. The Department of Energy’s 1991 report concluded that there was no “convincing evidence that useful sources of energy will result from the phenomena attributed to cold fusion.” The NBAC supported President Bill Clinton’s ban on human cloning and recommended a moratorium on federal funding for any attempt to create a child using cloning techniques. All of Koonin’s examples addressed issues that are far more contained and discrete than climate. Nor were they as thoroughly politicized and polarized as what Christy calls the “murky and wicked” science of climate change. 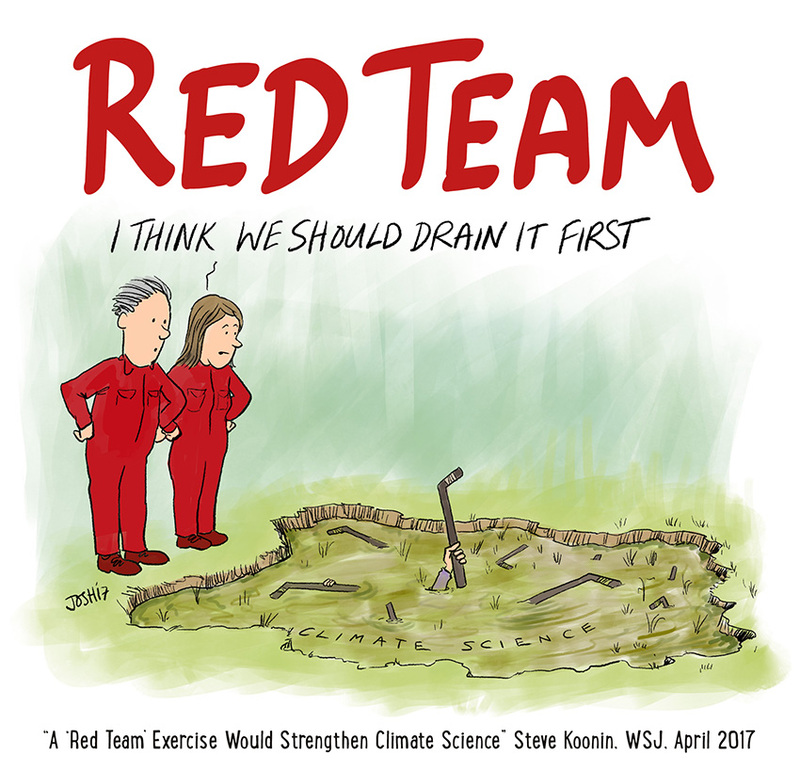 I shudder to think how eagerly environmental activists would welcome proposals to Red Team the consensus over the safety biotech crops and nuclear power. Joseph Majkut, the director of climate policy at the Niskanen Institute, points to examples of Red Teaming in clear-cut evidentiary debates over climate data. For instance, there was the Berkeley Earth effort to evaluate the concerns of skeptics about how global temperature records were generated. The Berkeley Earth results matched those of other surface temperature trends, and the researchers concluded that adding carbon dioxide to the atmosphere via burning fossil fuels is largely responsible for rising average global temperatures. Majkut also notes how researchers at Remote Sensing Systems (RSS) essentially Red Teamed the satellite temperature trend records developed by Christy and his colleague Roy Spencer. They found that Christy and Spencer’s data set needed to be corrected for satellite drift, which boosted the global temperature trend. Interestingly, RSS recently reanalyzed its own satellite temperature data set and has significantly boosted the rate of increase in global average temperature. Now the differences between the two data sets will have to be ironed out. If the Trump administration does pursue climate Red Teaming, it should create several individual panels that focus on specific problems. For example, climate sensitivity is conventionally defined as how much warming would occur as a result of doubling atmospheric carbon dioxide. Researchers who are skeptical of catastrophic warming scenarios point to low-end estimates of future man-made warming. Yesterday, the journal Science Advances published a new analysis that suggests that the computer climate models’ higher estimates of climate sensitivity are correct. All temperature datasets require adjustments to take into account things like weather station location shifts, equipment changes, and satellite orbital drift. Another Red Team might focus on the propriety of these adjustment processes. For example, a team of skeptical researchers just published a working paper claiming that all three major surface temperature data sets have been spuriously adjusted so as to increase their apparent rates of warming. This new paper’s analysis relies, in part, on the old RSS dataset, so it will be interesting to see how the new higher RSS temperature trend data affects their conclusions. Given that much of policy is being based on the projections of computer climate models, a Red Team composed of statisticians and computer scientists from outside the climate establishment could make proposals that usefully enhance public confidence in those models. Assume that the Trump administration can actually find and persuade qualified people to participate in good faith with climate Red Teams. Is it reasonable to hope that the results of such an exercise would actually change climate-change partisans’ minds? Probably not, but we may as well give it a try.